Click below to make a secure donation with your credit card. 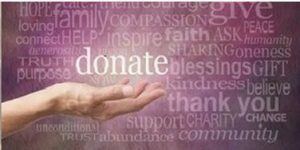 At Santa Fe Center for Spiritual Living, we practice conscious giving. As an organization we practice the Universal Law of Circulation that as we give of our time, talents, and money it is returned to us multiplied. Your tax-deductible gift to SFCSL helps us to extend the philosophy of Science of Mind, while flourishing as a spiritual center and supporting our community. Your gift also confirms that this life-affirming philosophy of Science of Mind and Spirit is making a difference in your own life. General contributions go to support our operations at SFCSL; in addition to providing our message to the world via our live streaming and video archives. We practice what we teach and tithe 10% of donations back into the community to local charities; and also to seed projects, such as the Pamoja Project that helps children with AIDS in Tanzania. You will receive a tax form via email, and/or via your billing address at the end of the year. Thank you for sharing your abundance!